"And that, my friends, is how you get through the Water Temple in The Legend of Zelda." EA Sports hooked up Jon Jones more than it realized. 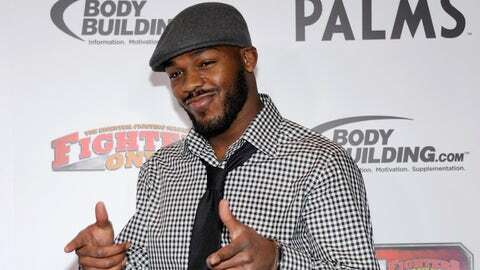 The UFC light heavyweight champion’s video-game likeness was released this week and it may or may not have added some spice to his marriage. "They’ve made me sexier," Jones told SI.com’s Extra Mustard. "It’s the real deal. I even caught my wife looking at it. She’s in love with me in the game." We have to admit - pixelated Jon Jones looks pretty awesome. Same with the screen caps of Georges St-Pierre and Alexander Gustafsson. They look more lifelike than any previous UFC video game by a long shot. Jones and Gustafsson, who might have put on the 2013 Fight of the Year back in September, will be the cover boys for the UFC’s first EA Sports video game. The title is supposed to drop sometime in the spring, perhaps right around the time the UFC could be booking a rematch between the two. Both have fights lined up currently, with Jones facing Glover Teixeira in April and Gustafsson meeting Jimi Manuwa in March. "Me beating my next opponent and Gustafsson beating his next opponent is going to make that rematch even bigger than it would have been," Jones said. "It will all work out." Until it happens, you can always just pit the video-game versions of the two together in the Octagon. Jones’ wife won’t mind a bit.